* Use a top stitch needle (Schmetz System 130N) for best results with all your machine embroidery threads (rayon, silk, burmilana, metallic, sliver, cotton etc). The big eye prevents the threads from fraying and allows you to use 2-3 threads through the one needle. The needles come in sizes 80, 90, 100 & 110 and the size relates to the thickness of your stitching surface. 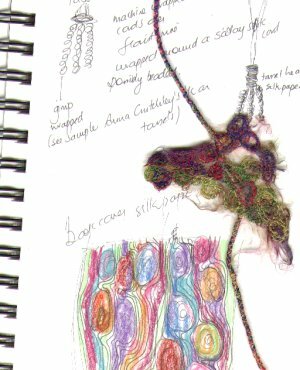 * Try blending your own threads through the needle to create new colours. i.e. put blue/green together, or red/yellow. Gold/Silver together is also a good combination and gold with a colour is worth a try too. * Don't be afraid to play with your tension dials - sometimes you get really interesting effects by tightening and loosening the tension. * Colour experimenting - take 3 primary colours red/yellow/blue and try them in different combinations. e.g. 2 colours in the top and the 3rd in the bobbin. 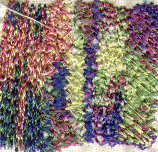 Try straight stitch/zig-zag/automatic stitches and change the tension for different effects. 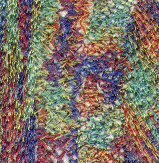 * Variegated threads -by combining 2 variegated threads of the same colour through your needle you can create many "new" colour combinations or if you have variegated threads which have a lot of white in them, try mixing with a plain colour. * Do lots of samples - it's really okay to play. Playing extends your creativity and practice makes it easier. Forget the housework - this is more important and strange as it sounds, housework keeps! * Keep a notebook for all your samples - if you like something stick it in and write in your comments. If you don't like it, it still might be worth sticking that in too so you can avoid it next time! 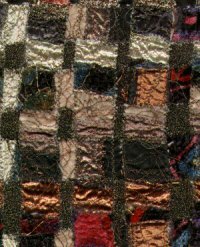 * If you don't like what you have created, cut it up and resew over it, or stitch all over it and then cut it up, or paint it. 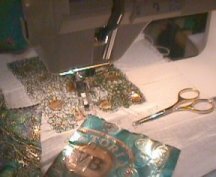 Remember, there are no failures in machine embroidery!